Photos by Amy Carter ©Amy Carter 2012; all rights reserved. WINBAK FARM, in Chesapeake City, Maryland is one of the country's leading Standardbred nurseries. Owned by Joe and JoAnn Thomson, the farm was established in 1991 when three parcels were purchased and combined to create the present Winbak Farm. One of those tracts was the world famous Windfields Farm Maryland division, formerly owned by Canadian E.P. Taylor. Taylor had acquired the property in July of 1968 to expand his Ontario-based operation in America, purchasing a 200 acre farm adjacent to Woodstock Farm, owned by his friend, Allaire DuPont. In October, 1968, Taylor moved his Canadian Leading Sire, Neactic to stand at Woodstock Farm, and his Queen's Plate winner Northern Dancer to stand at the newly built Windfields Maryland stallion barn. 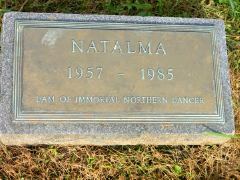 Northern Dancer stood the remainder of his epic stud career here, to his retirement in 1987 and death in 1990. 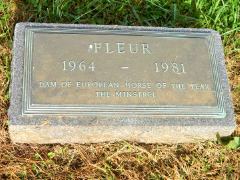 Northern Dancer's body was sent to his birthplace at Windfields in Canada for burial, but Windfields Farm Maryland division was already the final resting place of several of Taylor's most important broodmares: the great racemare FLAMING PAGE (the dam of English Triple Crown winner Nijinsky II), her daughter FLEUR (dam of Derby winner The Minstrel), and NATALMA (dam of Northern Dancer). After Northern Dancer's death, the Windfields Maryland farm was sold off in three tracts. The main tract, including the famous stallion barn, became Northview Stallion Station. 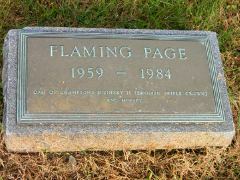 Another parcel, including the broodmare cemetery, became part of WINBAK FARM in 1991. Among the noted Standardbreds buried here are the U.S. Harness Racing Hall of Fame and Canadian Hall of Fame mare CLASSIC WISH, who died after foaling a live colt in 2011. She was a winner of $436,000 and an outstanding broodmare that produced the 2000 Breeders Crown and Little Brown Jug winner Bettors Delight; Breeders Crown, Pacing Triple Crown winner, and 2003 U.S. Horse of the Year No Pun Intended, and other foals whose total earnings topped $5 million dollars. An equally famous Standardbred broodmare, MARGIE'S MELODY (by Bret Hanover), earned $94,303 and paced in 1:55. Her first foal, Nihilator, was the 1985 Horse of the Year at age three, winner of the Little Brown Jug, Breeders Crown, Tattersalls Pace, and many other races; purchased by Winbak in 1998, she produced two foals at the farm, including Winbak stallion Veeza, and a filly Margie's Song, a broodmare at Winbak. 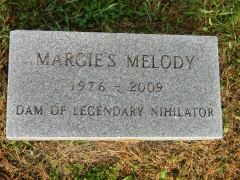 MARGIE'S MELODY died in 2009 at the age of 33. -- A.P. and P.E. ©2002 - 2013Thoroughbred Heritage. All rights reserved.